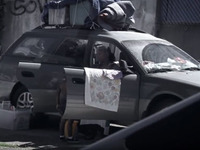 As CBS News reports, the number of people who live in their cars because they can't find affordable housing is on the rise with the problem increasing in cities with expensive housing markets, including Los Angeles, Portland and San Francisco. This problem is one Volunteers of America Illinois and Volunteers of America, Dakotas are all too familiar with. 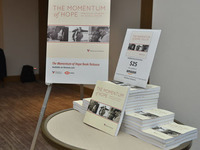 More than 100 leaders from the human services, veterans, caregiving, faith and corporate communities came together May 15 to celebrate the launch of Volunteers of America’s new book: “The Momentum of Hope: Personal Stories of Moral Injury.” The book is part of our moral injury initiative through which we will explore the effects of moral injury and ways we can reach those affected. 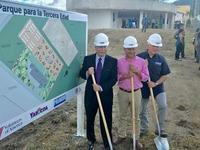 On December 13, 2017, Volunteers of America broke ground on Parque para la Tercera Edad (Park for the Third Age) situated in the city center of Yabucoa, Puerto Rico. Volunteers of America has had a presence in Puerto Rico since 2007 with community corrections and housing programs and is excited to be partnering on this new park. Local Baton Rouge area Home Depot volunteers helped spruce up Volunteers of America Greater Baton Rouge’s affordable housing apartments by putting up a new privacy fence, installing a decorative railing, adding raised garden beds and re-landscaping the flower beds. 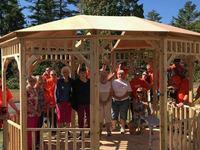 Home Depot employees recently volunteered their time building a gazebo for the senior residents of Volunteers of America Northern New England’s Richard Brown House, an affordable housing community for low-income seniors. 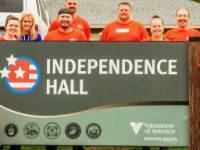 Home Depot volunteers painted, built closets and provided new stoves to Independence Hall, a 20-bed men's transitional housing facility located in Billings, MT for honorably discharged veterans. The facility operates 24 hours a day and includes a full kitchen, a laundry room, dining and living space which includes a TV area, computer & resource room, a conference room and an outside area. Sixteen patient and provider groups oppose the proposal put forward by Senators Lindsey Graham (R-S.C.), Bill Cassidy (R-La. 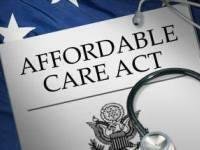 ), Dean Heller (R-Nev.), and Ron Johnson (R-Wis.) that will negatively impact patients’ access to adequate and affordable health coverage and care. Blue Butterfly Village, our permanent supportive housing for previously homeless veterans, has won the prestigious Vanguard Award. Blue Butterfly Village is on the site of a former naval base and the project was developed with 9% LIHTCs and many other sources, including HUD VASH. Numerous female veterans and their families have had their lives changed by this project. Home Depot volunteers lent their gardening expertise to Volunteers of America Northern Rockies by helping out in their Veterans Honor Garden. There were over 30 volunteers at times throughout the day from both Home Depot and Volunteers of America that took part in the project. Earlier this week, more than 250 Home Depot volunteers and staff helped Volunteers of America Florida create 7,000 hygiene kits for homeless veterans throughout the state of Florida. Orange shirts took over the Veterans Transitional Living Facility Nov. 10, as more than 100 Team Depot volunteers participated in Veterans Day projects, including landscaping, painting and building renovations. “I’ll Be Me,” the documentary chronicling Glen Campbell’s Goodbye Tour after being diagnosed with Alzheimer’s, will be shown again on CNN on Saturday, Nov. 7, at 8 p.m. ET. Volunteers of America is a proud sponsor of the film. Be sure to tune in for a 60-second Volunteers of America video that will be shown during the movie. Over a dozen volunteers from the Tallahassee, Home Depot store recently banded together, as part of TEAM DEPOT to beautify Tallahassee Veteran’s Village, a Volunteers of America of Florida transitional housing development. 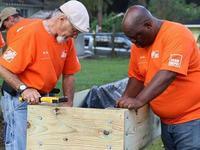 On Thursday, October 22 more than 20 area Home Depot associates partnered with Volunteers of America of Florida to transform the home of Army veteran Jerry Garcia. This local volunteer project is part of the Home Depot’s fifth annual Celebration of Service campaign, a nationwide effort led by Team Depot, The Home Depot’s associate-led volunteer force, to help give back to veterans in need. On Friday, Oct. 16, more than 25 area Home Depot associates transformed the Commonwealth Veterans Residence, which provides safe, supportive housing to local veterans. This local volunteer project was part of the company’s fifth annual Celebration of Service campaign, a nationwide effort led by Team Depot, The Home Depot’s associate-led volunteer force, to help give back to veterans in need. The “Rock Your Richard” Charity Campaign is a friendly two-week costume challenge where fans will submit pictures of themselves dressed up in their best Richard costume. For each picture submitted, you can choose to have a donation made to Volunteers of America. Last week, over 300 Home Depot employees helped put the finishing touches on Blue Butterfly Village, a community for homeless female veterans in Los Angeles.